You’ve no doubt heard this phrase uttered many times throughout your life. NHL officials certainly have, and they took the phrase to a new level with outdoor games. 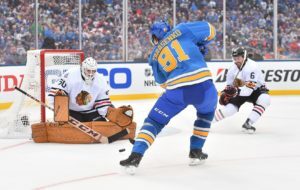 Beginning in 2003 when the Edmonton Oilers and Montreal Canadiens played at Commonwealth Stadium in Edmonton, Alberta, and, most recently, Monday when the St. Louis Blues hosted the Chicago Blackhawks at Busch Stadium, NHL fans have seen a plethora of outdoor games. The Winter Classic didn’t become an annual event until 2008 when the Buffalo Sabres hosted the Pittsburgh Penguins at Ralph Wilson Stadium. In the beginning, one outdoor game was played each year on Jan. 1. It was an exciting beginning to a new year. It was magical; it brought back memories of skating on ponds or backyard rinks, and it brought hockey back to its roots. The NHL had a wonderful idea: It turned one regular season game into a league-wide spectacle. Fans outside of Pittsburgh and Buffalo tuned in to watch Sidney Crosby score the game-winning shootout goal in 2008 as the snow fell and turned Ralph Wilson Stadium into a life-sized snow globe. It perfectly encapsulated what it meant to play hockey as a kid. However, the league got greedy, and now, the novelty of the outdoor game has worn out. Beginning in 2011, the NHL held two outdoor games. First, the Winter Classic was held Jan. 1, 2011, featuring the Washington Capitals and the Pittsburgh Penguins at Heinz Field. Almost two months later, the Montreal Canadiens and Calgary Flames faced each other in the Heritage Classic in Calgary, Alberta. In 2014, the NHL had a record six outdoor games, introducing the Stadium Series. This is when the novelty of the outdoor game wore off. Eleven teams played outdoor games that season, with the New York Rangers being featured in two of them. It was overkill. The NHL took a good thing and made it a regular occurrence. Aside from the fact the game was played outdoors, one of the bigger draws to attending an outdoor game was its rarity. For four years, only one city got the privilege of hosting an outdoor game, which made it more special for the teams and players involved and the fans attending. Since 2014, at least four teams have participated in outdoor games each season, including eight in 2016 and six in 2017. According to Sportsnet’s Chris Johnston, the NHL is looking at hosting three more outdoor games in 2018. The NHL is looking at holding three outdoor games next season, per Gary Bettman. In total, 23 of 30 teams have participated in an outdoor game since 2003, and the NHL certainly has played favorites. The Chicago Blackhawks just played in their fifth outdoor game Monday, including their fourth game in as many seasons. The Detroit Red Wings played in their fourth outdoor game Sunday in Toronto, which was a rematch of the 2014 Winter Classic against the Toronto Maple Leafs at Michigan Stadium in Ann Arbor. And the Pittsburgh Penguins will play in their fourth outdoor game Feb. 25, as they host the Philadelphia Flyers (third outdoor game) at a venue that already has featured an outdoor game (Heinz Field). That’s a big red flag the league might be overdoing it when it has to repeat matchups and stadiums in order to draw in viewers. This season featured just one new team competing in an outdoor game — the St. Louis Blues, a team that deserved an outdoor game a long time ago. The NHL originally featured teams from cold-weather cities in the outdoor games, but in 2014, the Los Angeles Kings hosted the Anaheim Ducks at Dodger Stadium. The next season, the San Jose Sharks hosted the Kings at Levi’s Stadium. So, it’s not as if the outdoor games are limited to cold-weather cities. The Winter Classic/Heritage Classic/Stadium Series no longer is a league-wide spectacle. It has been diluted with the same teams, and it’s only exciting for the teams and the fan bases involved — it’s a regional spectacle. And even then, it’s going to be harder for casual fans to get excited about an outdoor game when the same teams are featured year after year. The league had it right when two teams played one outdoor game each year. Certainly, there is such a thing as having too much of a good thing.